This snapshot is remarkable for the people gathered in front of the racing car. The photograph was taken at the Gordon Bennett Race eliminating trials held on the Duke of Portland’s estate at Welbeck, Nottinghamshire on 25th April 1903. The race itself was then held at Athy in Ireland on 2nd July of that year. 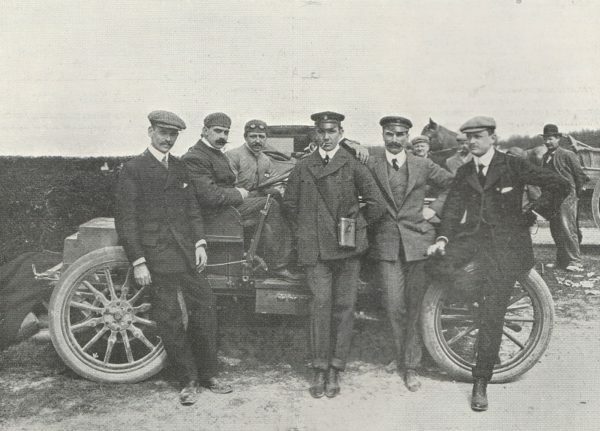 The car is one of the five Napiers entered for the trials – and the five drivers, from left to right in the picture, are Mark Mayhew, J W Stocks, Charles Jarrott, Selwyn Francis Edge and the Hon. Charles Rolls. The elimination process was complex: the 1902 race was held on 26th–28th June 1902 on public roads between Paris and Innsbruck. France was defending the cup against Britain, and each country was represented by three entries. Selwyn Edge, driving a Napier, and representing the Automobile Club of Britain and Ireland, was the only competitor to finish the race – so Britain was the winner of the Gordon Bennett Cup and would be required to defend it in Britain the following year. As holders of the cup, Napier were given the first two places in the British team. The third spot was to be decided in the “English Elimination Trial” known as the Welbeck Trials and held on 25th April at Welbeck and at the Dashwood hillclimb in Buckinghamshire on 27th April. The complexities do not end there. Racing on public roads in Britain was illegal, so Claude Johnson, the secretary of the Automobile Club of Britain and Ireland, suggested that the race should be held in Ireland. The editor of the Dublin Motor News, Richard J. Mecredy, proposed an area in County Kildare, and letters were sent to Irish MPs and peers, newspapers, council chairmen and secretaries, mayors, railway companies, hoteliers and the Bishop of Kildare and Leighlin. This worked. Legislation was needed, so the ‘Light Locomotives (Ireland) Bill’ was passed on 27th March 1903. As a compliment to Ireland the British team chose to race in Shamrock green, which thus became known as British racing green, although the winning Napier of 1902 had been painted olive green. And the result of the trials? Of the men in our picture, Stocks was first, Rolls second and Mayhew third – so Stocks took the third Napier in the race, with Edge and Jarrott already guaranteed places. None of the three Napiers was placed, and the race was won by Jenatzy in a Mercedes. And in our story are three men who would soon be involved in the history of Rolls-Royce: Charles Rolls; Claude Johnson, brilliant organiser and the firm’s founding Managing Director, the self-styled “hyphen in Rolls-Royce”; and Selwyn Edge, arch rival to Rolls-Royce through his vigorous promotion of Napier cars.